A color way/stripe repeat. Nor have I finished the gusset. But I have come close! One more color stripe to complete a repeat.. and 8 more rounds to finish the gusset. And to be fair, it is a big deep gusset. The socks have 64 stitches; 32 were used for the flap, and after the turning, 18 stitches remain. Mind you the flap had 34 rows (17 chains along each edge), not 32 (as you'd expect). Then, as I picked up stitches, there were 2 bonus stitches to make tight corners. But now with just 4 more sets of decreases, (and just 70 stitches per round now, and fewer ever other round!) rounds are going faster. There is a bonus to this—since extra round of gussets means one few round of foot. I frequently do this--(add an extra few rows to flap/pick up extra stitches in gusset to start) I have a high instep and the long deep gussets insures a better, more comfortable fit. And now with most of the gusset done—and the socks displayed on LEGS—you can see the bobble and lace clock—a bit of a echo of the small picot and chevron shaping of the top edge. 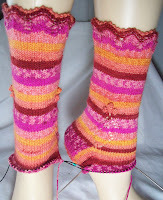 I first did nupps (and on the first version of the Crowning Achievement socks I did pepper stitch) and thought both textural effects were too subtle. So I went with bobbles—and now I think the bobbles are too much (aren't bobbles always too much?) I had thought about 5 bobbles (positioned at point 1, 3 (-3) and 5 (-5)) making the bobbles as wide as the lace chevron and diamond. But I am so glad I stopped at 3—3 are more then enough! Meanwhile the rain has stopped (and I am high and dry)--with record totals-and massive flooding in low lying areas. But the sky's are still grey and overcast. I shouldn't complain (it's a love mild 74°(circa 23°c)--and really, I would much rather have cooler temps (even if it means no pool!) than the sering temps we had at the end of last month (Who can forget 106°/41° in the daytime and 90°/32° at night!) Besides—It's Tuesday! I will get to my Tuesday night knitting in LIC two weeks in a row!